Cortez, a band from Boston, has been around for a considerable time, playing in venues throughout the Boston area, while venturing out on more than one occasion to surrounding states, all the while honing their sound, attracting an ever growing following of fans, and gaining a reputation as a group that would put on a show worthy of attending, a show laden with heavy, loud, and unbelievable guitar work, driving drums, and fast, boisterous bass riffs, all accentuated with sonorous, powerful vocals. 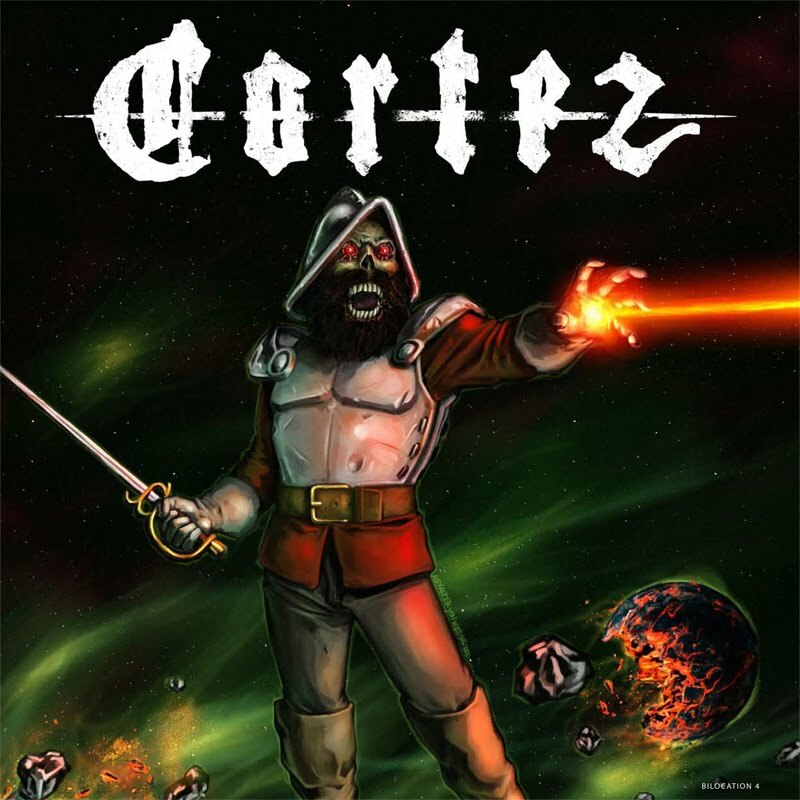 Cortez consists of 4 members who handle the 4 main duties of classic, heavy rock. Jay Furlo deftly thumps out the bass work, while performing double duty on backing vocals. The drums are expertly handled by Jeremy Hemond, while guitars are masterfully rendered by Scott O’Dowd, as Matt Harrington belts out his high octane vocals. Together they are able to create a sound that is at once unique and refreshing, while being somewhat derivative of the very best rock of the seventies and nineties. While it may be unusual for a debut album from a relatively obscure band to sound so incredibly professional and artistically rich, some of it must be down to the amount of time the members of Cortez have spent together playing to crowds and audiences who most likely offered immediate and insightful feedback. Whatever the contributing factors, it all worked well, allowing this group of gifted fuzz merchants to attain a high degree of accomplishment in the most important areas of what makes up a great rock album. Always the first part on any heavy rock compilation will be the guitar work. Scott O’Dowd has on this record done a tremendous job of playing with dexterity, laying down the main, fuzzed out riffs while cranking out ‘through the roof’ solos, setting a perfect level of distortion, playing often to a slower tempo that lends itself to the powerful sound of stoner rock on many of the selections, while increasing the pace on others, often displaying that great high desert sound, or cranking out more traditional power chords when required. Through ten of the eleven songs Scott stamps his unmistakable quality on the guitar work, providing those songs with the meaty, masterful, mind blowing sounds that goes the longest distance for setting the tone of how Cortez will quite probably be known. The one exception is “Nostrum”, which foregoes Scott’s masterful guitar for a guest spot on the Hammond organ by Chris ‘Cropduster’ Coughlin. Cortez does not disappoint when it comes to the level of quality from the drumwork by Jeremy and the massive bass of Jay, both of whom do not hide in the background with tepid renditions of the required rhythm, nor do they try to overplay the vocals and solos, but instead provide a great balance to the songs by playing with skill and passion, keeping the almost tribal tempo of these powerful and evocative songs flowing at the perfect pace. A rare and unusual part of this band are the vocals provided by Matt, who has a very gifted set of pipes that lend themselves perfectly to the sound generated by Cortez. Matt is able to incorporate his voice into the makeup and flow of the music, making it an integral, key aspect to the wonderful sound. Not only does he display a range in his ability to sing up and down the scale, but he also knows how to do so. Often, this area can be diminished in accomplishment, robustness, or capability, but Cortez does not lack in this regard, delivering crisp, clear, soulful vocal sounds that creates a crowning achievement to the music.